In this post we shall discuss finiteness properties of groups and an important class of examples known as the Bieri–Stallings groups. Our main tool will be combinatorial Morse theory. In order to define our finiteness properties, we must first define an Eilenberg–MacLane space. Definition. An Eilenberg–MacLane space for a group , also known as a , is a connected CW–complex such that and the universal cover of is contractible. We can construct an Eilenberg–MacLane space for a group using its presentation –complex . This is an inductive procedure. In the first step, we attach –cells to render the second homotopy group trivial. At stage , we attach –cells to make the complex –aspherical. At the end of this procedure we obtain a complex which is aspherical with and for all . Since all the higher homotopy groups are trivial, the universal cover of is contractible. 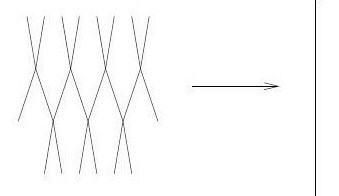 A group is said to be of type if it has an Eilenberg–MacLane space with a finite –skeleton. These properties generalize the notions of being finitely generated and of being finitely presented. Any group is of type , since it has an Eilenberg–MacLane space with exactly one vertex. Using our construction of the Eilenberg–MacLane space from the presentation -complex, one sees that being of type is equivalent to being finitely generated, and being of type is equivalent to being finitely presented. from the -fold direct product of rank–two free groups to the integers, defined by mapping all the and to . The Bieri–Stallings groups are the kernels of the maps . The Bieri–Stallings groups display a range of finiteness properties. Theorem. is of type but not of type . In our next post we shall discuss a proof of this result in its full generality that uses Brown’s Criterion. In the remainder of this post we shall prove the theorem for two particular cases, namely and , via Morse Theory — a topic we will now introduce. An affine cell complex is a cell complex where, for a fixed , each cell is equipped with characteristic maps such that is a convex polyhedron and the characteristic map is a continuous function. Additionally restricted to any face of is the characteristic function of a cell in . A Morse function is a map from an affine cell complex to the real numbers with the following properties. The image of the -skeleton of under the map is a discrete subset of . If the restriction of on any cell is a constant function then the cell is -dimensional. And finally, for every cell , the map can be extended to an affine map from to . Note that the last property implies that the maxima of restricted to any cell is achieved at a vertex. The link of a vertex is the set of tangent vectors to the space at which point into cells that contain . The descending link of a vertex is the subset of the link which consists of tangent vectors that point to cells which have the property that , when restricted to them, achieves its maximum value at . The ascending link of a vertex is defined similarly with the word maximum replaced by minimum in the previous sentence. Now we are ready to state Morse’s Lemma, which will play a central role in much of our reasoning that follows. In our application of Morse’s Lemma below, our Morse function will be symmetric in the sense that will also be a Morse function. So Morse’s Lemma will apply for extending our pre-image downwards with the phrase “descending links” replaced by “ascending links”. This account is based on that of N. Brady in Section 2.4 of Dehn Functions and Non-Positive Curvature, CRM Notes. First we claim is not finitely generated. Consider a map , which takes each circle in the wedge sum homeomorphically to the circle. On the fundamental groups, this induces our map , the kernel of which is . The lift of to the universal covers, where is the infinite -valent tree, is illustrated below and is a Morse function. Note that acts on by deck transformations so that for any vertex , and . An analysis of will show that is not finitely generated. Note that is a set of vertices of on which acts freely — indeed, there is a bijective correspondence between and since there are no loops in and since there is a unique path in between any two vertices whose edges determine an element of . So would be finitely generated if and only if we could attach finitely many families of –equivariant -cells to to render it connected. Suppose this were possible. Then it would be done within the preimage of some bounded interval with integer endpoints since acts horizontally on the tree, and hence on each of the families of cells mentioned above. Now any two points in can be joined by a path in , and the descending link of each vertex is non empty. So, by Morse’s Lemma, no new path–components are introduced when the pre-image is extended to . So is path connected. But this is false and so a contradiction: at any vertex in , the descending link is a -sphere whose two points are joined by a path within , and this would lead to there being a loop in the tree . Next we will show that is finitely generated but not finitely presented. This time we consider a map where and was defined previously. Lift to a Morse function on the universal covers, analogous to that in the previous example. Given a point in the height changes as a sum of the distances traveled along both the individual wedge sums of circles with the prescribed orientation. We write where represent the paths around each of the four . We claim that is path–connected. Let be the lone vertex of . The group acts horizontally and freely on with a compact quotient homeomorphic to the inverse image . But the inverse image is a wedge–sum of four circles, specifically the diagonals of the 2–cells arising from the four . So, fixing a vertex in , it is enough to show that for every there is a path in from to . Let be the two generators on one of the free groups of our product of free groups, and let be a generator of a different free group in the product. Consider the word representing some . Well, freely equals and one can travel first along and then along to reach whist staying in throughout. The reader should convince themselves that such an arrangement is possible for any word representing an element of . is a short exact sequence. So is finitely generated since . Finally suppose, for a contradiction, is finitely presented. As we saw above, the quotient of by is a wedge–sum of four circles that correspond to a generating set for . Attaching finitely many -cells to this -complex gives the presentation –complex of . Now, is the Cayley graph of with generators being the lifts of the -cells on the presentation 2-complex. we get that is trivial since . The finite set of -equivariant families of -cells pasted on to our level set are in the preimage of some interval with integer endpoints that contains . Since loops in are null-homotopic in , by Morse’s lemma must itself be simply connected. But, as we will explain, this is a contradiction. Consider the descending link of any vertex of height . This is a -sphere, which must be nullhomotopic inside . But this gives us a nontrivial -cycle inside the contractible -complex .